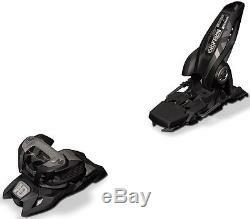 Marker Griffon ID Ski Bindings, 90mm, Black. The ultimate freeski binding is now even more versatile! - will fit skis up to 90mm underfoot. 90mm - Will fit skis up to 90mm waist width. The Marker Royal Family range is a benchmark in freeski bindings. Eric Pollard, Pep Fujas, Andy Parry and even the late great Shane Mcconkey - some of the best skiers in the world have used the Marker Griffon to push skiing in their own direction. For the 2017 season, Marker have tweaked the Griffon to create the Griffon ID by adding the height-adjustable ID Sole toe piece, making it compatible with Alpine Touring boot soles as well as traditional soles. This binding has all the same great durability, power transmission and torsional stiffness that riders all over the world have come to expect, and now works with any ski boot! ID Sole - Compatible with Alpine Touring and Traditional ski boot soles. Toe Piece - Triple Pivot Elite Toe mounts the spring mechanism horizontally to produce a more compact design with even weight distribution. Heel Piece - Inter Pivot Heel reduces the instance of early release whilst offering direct pressure to the boot sole when a release is required. Rider Profile - All Mountain / Freestyle / Freeski. We are Absolute-Snow , the UK's leading independent retailer of extreme sports equipment and associated fashion clothing. We have a shop in Hemel Hempstead, Hertfordshire and visitors are most welcome. We have been in business since 2004 and are proud of our customer service record. Do a Google search for "Absolute-Snow" to find out more. Same Day Despatch Pay before 1.00pm Monday to Friday for same day despatch. We do not hang about and neither does your parcel! Collection from our shop, no problem. Most (but not all) items can be collected from our shop in Hemel Hempstead, just off the M1/M25 Some products are held in stock at our suppliers. Our address, road directions and opening hours can be seen on our Absolute-Snow website. We are an established UK retailer, with a bricks and mortar shop and have been trading online since 2004. Please do not return parcels without contacting us first because we have several warehouses and we need to tell you where your items should be sent. We believe our prices are the lowest on the internet. We price check all our competitors every week. We will price match if you find a better offer elsewhere. Please send us a link to where you have found it cheaper. Visitors to our shop, please refer to our Absolute-Snow website for our address, maps, road direction and our opening hours. The item "Marker Griffon ID Ski Bindings, 90mm, Black" is in sale since Thursday, May 11, 2017. This item is in the category "Sporting Goods\Skiing & Snowboarding\Downhill Skiing\Ski Bindings". The seller is "absolute-snow" and is located in Hemel Hempstead, HP3 9HD, UK.